It is with pleasure that we present our most interesting case of the month to our readers and friends. Jackson had shown up at the doorstep of a very kind-hearted and charitable family early in March 2007 and was welcomed into their household despite (or perhaps because of! ), a very seriously injured right eye, numerous heavy hair mats of his bib and chest areas, greasy skin and an overall unthrifty condition. He was obviously the kind of cat used to toughing it out in tough times yet still, he presented himself as a gentle soul who trusted humans implicitly. Jackson’s eye was so badly damaged that it was pushed backwards into his head and pus in his eye socket obscured a deformed, collapsed globe underneath the pus. It is reasonable to assume that his eye injury was associated with a very intense dispute with another cat over territorial rights some time in his recent past. As a hardened road warrior, it also seems reasonable to assume that he had bravely stood his ground but unfortunately the head on conflict had resulted in the sacrifice of his eye. A very short time after the family welcome into their home Jackson was brought to our clinic for a physical examination. The adventure of his first visit to our clinic did not appear to cause Jackson to become defensive or fearful, just a little wary. He seemed to accept this circumstance as if used to trudging through his life’s tall grass and determined to make the best of it, no matter what came his way. At the time of his assessment it was immediately apparent that Jackson’s eye was not salvageable by any medical or surgical means and that total eye removal (enucleation) was the only humane way to deal with his evident and significant eye pain. We performed this procedure a short while after his visit and also neutered and dematted him and cleaned his teeth as well. Jackson responded very well to his loving care over many years. Then, one day he was brought to us because his observant owners had noticed some vision problems and an unusual look to his remaining left eye. This problem warranted a thorough evaluation by a specialist, even more so because this was Jackson’s one and only eye, so an appointment was arranged for Jackson to be examined by the West Coast Veterinary Eye Specialists. The specialists diagnosed a chronic eye inflammation that had recently led to a cataract and early glaucoma (increased eye pressure). A cataract is a loss of transparency in the lens resulting in progressive loss of vision as the transparency loss worsens. Normally, the lens of the eye is as clear as glass. A poorly transparent lens can be compared to how one’s vision would be impaired looking through a misty window. (Approximately 2.5 million Canadians have cataracts of varying degrees of severity). Chronic eye inflammations are fairly common causes of cataracts in cats. Inflammation of the inner structure of the eye is often associated with viral and infectious causes such as Feline Leukemia, Feline Infectious Peritonitis and Toxoplasmosis. This inflammation can be quite painful as it advances in severity. Since Jackson was originally a stray of unknown background, he likely was exposed to one or more of these infectious agents some time prior to his arrival at his owners’ front door. Although, as in dogs and humans, cataract surgery in cats is involving replacement of the cloudy lens by an artificial new one is an option in selected cases, the specialists did not recommend this procedure for Jackson because his chronic eye inflammation and secondary glaucoma reduced the likelihood of a positive outcome. Instead, the specialists recommended a number of eye ointments and drops to be administered up to three times daily for as long as possible, with total blindness very likely to ensue in the foreseeable future despite these efforts. Now, two years later, thanks to the very compassionate family members who have diligently maintained Jackson’s medication schedule over these past two years, Jackson still has enough vision to be often seen striding along his family’s fence line on “patrol duty” ensuring that no intruders are lurking about. WANT TO KNOW HOW TO MAKE YOUR DOG LAUGH? BY Dr. Leslie Ross BSc. ; D.V.M. WANT TO KNOW HOW TO MAKE YOUR DOG LAUGH? A host of well-respected researchers of animal behavior, psychologists and neuroscientists from all over the world have successfully convinced the scientific community that dogs and some other non-human species of animals (like rats! ), will indeed laugh during play or chuckle and laugh even if they are just being playfully tickled! A dog’s laugh sounds similar to a breathy pant without cadence that can be intensified to a more guttural Ah …Ah sound. (For those desiring a virtual experience, a visit to youtube.com and search for “dogs laughing” will prove to be worth your while). In humans, laughter therapy has been well-researched and is considered to be a natural form of medicine that provides benefits to a person’s physical, emotional, and social well being. These benefits are so significant that laughter therapy is considered to be an effective therapeutic tool that health care professionals can pull out of their toolbox to assist troubled individuals suffering from a variety of psychological disorders. It can also be used to help people cope during particularly stressful times in their life. If one considers human laughter in simple terms, it is a visual display of an emotional response that is usually very positive, generally indicating joy and happiness. It sends a message of acceptance and trust in a social group, which is definitely an advantage, in evolutionary terms, allowing for peaceful group relationships. It can easily follow that non-human animals laugh in a similar way to communicate their desire for non-threatening social interaction and to be part of the group. In fact, it is now established by well-documented research that dogs, like humans, do indeed benefit from dog-laughs. Studies have indicated that recorded dog-laughs played to dogs in a shelter setting, can relax and calm them and encourage dog play. This benefit is so significant that for a number of years numerous shelters housing relinquished or lost dogs have been using recorded dog laughs as a tool, since calm, playful dogs are less prone to injury and are more adoptable. So, this begs the question of whether dogs are capable of other emotions that parallel human feelings, at least in a rudimentary way. Universally, scientists of animal behavior of modern times are now modifying their concepts of animal minds in ways that would astound scientists of previous eras. As late as the last century, for example it was commonly believed that animals and birds functioned totally at an instinctive level, with no capability to experience cognitive thoughts or emotions. Now, in our 21st century, the majority of animal behavior researchers support the belief that companion pets and many types of non-human animals and birds are feeling, sentient beings rather than just living creatures that are pre-programmed to react in a pre-determined way to a positive or negative stimulus. As technology advances in the fields of diagnostic imaging, even staunch skeptics are realizing that brain structures responsible for higher brain functions in many higher level animal brains are often quite similar to that of human brain structures. Take, for example, the fact that the scientific community now agrees in principle that pets can experience some degree of sadness and grieve over the loss of a favored household companion or the loss from their lives of a primary care-giver. This “elephant in the room” concept comes as little surprise to the great majority of pet owners, some of whom may have experienced first hand their pet seeming to grieve or have shared experiences with other astute pet owners that have experienced pet grieving behavior. Of course, there is always a degree of anthromorphizing that can enter into a discussion of cognition and abstract thinking capabilities of animals and birds, however, as diagnostic imaging technology becomes more refined from year to year it is becoming clearly evident that the bold black line defining animal thought processes as separate from those of humans, is now being erased and redrawn. FOOD FOR THOUGHT ( FROM A PARROT'S POINT OF VIEW) by Dr. Leslie Ross BSc. ; D.V.M. Greetings my devoted fans! Recently I have been on vacation with my owners so I have not had the chance to touch bases with you for some time. Please accept my apologies! My folks seem to love my companionship and can never seem to trust leaving me at home with even the best of caregivers to keep me company. I love my folks with all my heart so I can accept their separation anxiety issues, in keeping, I guess, with my unique personal attributes that they can’t bear to be without for long. But wait… how presumptuous of me to have veered off the flight plan of this discussion so early…now back to the task at hand! I have chosen as my subject of focus for today basic feeding guidelines for cage birds, But before I plunge into this discussion it seems appropriate at this time for me to clarify my identity. I will in brief describe myself as a very fit, rather buff Amazon parrot in the prime of my life. I enjoy as a hobby informing my expanding alliance of friends and fans of important details associated with bird care and further, at relevant times, my philosophy about life and the human condition from my birds-eye view. But forgive me; I have digressed from my topic. In a nutshell, I would like to state that by providing a fresh, nutritionally complete and balanced diet to your pet bird you are implementing one of the best ways to protect and promote his or her good health and allow for an extended life. Fresh, nourishing food attractively served encourages birds to enjoy their meal and have strong and healthy bodies and further, vigorous immune systems to help them ward of disease. Now, it is of paramount importance for me to point out that there is no one-size-fits-all recommendation for the optimum diet of different species of birds. The reason, of course, is that nutrition is a very complex subject, and a healthy diet for one bird species or individual may vary widely depending on the individual’s environment, general health, age and genetic makeup. Still, as a general guideline, ongoing research is indicating that the best kind of bird diet, is mostly composed of pellets (kibble-like formulated food), vegetables and for larger type birds, fruit in limited amounts. For the daily menu of parrots, (a category of bird very close to my heart), the consensus of the experts is, as a rule of thumb, that it is best to offer a diet consisting of about 60-80% pellets and 20-40% vegetables with some, but limited, access to fruit. Some well-meaning folks like to offer meat to their parrots; In general, meat is too high in fat and cholesterol to be of any real health benefit. Other folks like to feed Chinese herbs. Although it is fair to say that there is some promise in this field, not enough research is yet present to consider them safe and in fact in some cases they can actually be dangerous for your bird buddy. Nuts in limited quantities are safe and well appreciated by most parrots. However, their fat content is again quite high so it is important not to over-feed these treats. Much of the same applies to smaller bird types such as budgies, canaries, finches and lovebirds. Optimally, these little guys do best on a pelleted diet formulated especially for their bird type, with very limited access to seeds. Fruit is generally unappreciated by these folks but veggies, especially slivered or grated, are often welcomed. Also, for many of these birds, on special occasions a mealworm or wax worm or a small insect is a delightful change from their routine daily menu. (As an aside, on the subject of pelleted formulations, if I had two thumbs, both would be up supporting companies such as Lafeber's Harrison's Roudybush Volkman, McBrides, Pretty Bird, Zupreem, and Topper Bird. Although the above list is not by any means meant to exclude other manufacturers that may produce excellent pelleted bird food, these named companies are well established and produce good quality, tasty products in my humble opinion). Very unfortunately, many birds of all types are not accustomed to eating pelleted bird food because they were not introduced to it at an early age. I might be able to help you change your bird over with a little trick! Try pressing a few pellets into a small piece of wheat bread then, as you change over; gradually take more and more of the bread away. I should caution you however that bread should not be a daily ration as it is not really nutritious for us birds. Now, if this bread trick doesn’t work, try soaking the pellets in a little fruit juice before hand feeding them to your bird. Persistence is the key but be sure that you don’t end up with your bird buddy going on a hunger strike. Before moving on with my discussion I should point out one more little detail about pelleted foods that is helpful to be aware of, which is that some of these foods contain food coloring resulting in rather colorful, even fluorescent orange or red stools that are no cause for alarm! With regards to vegetables, ideally, the vegetables should be fresh and certified organic whenever available. It is best to offer dark leafy- green vegetables such as kale, collards and mustard quite frequently. These veggies are high in calcium and good for your bird. More occasionally spinach, bok choy and chard can be offered as well. Even frozen mixed vegetables can be very good as an option, and often are more convenient at certain times of they year. Frozen peas, corn, carrots and beans; bell peppers, and sweet corn on the cob are all just fine. For added variety, for all of us birds, non-toxic garden weeds such as dandelion and milk thistle can be added to our menus, but nix on the avocados, and onions, (which can be toxic to many bird species). Also, a small amount of healthy people- food in moderation and the occasional chili once in a while to spice up your bird’s life is fine. (With an emphasis on “in moderation “…never forget that we are not exactly heavy weights in the animal kingdom, so a little snack to a person can be a huge meal for us birds). Have you noticed yet? ?…no mention of seeds! Well, now is the time for me to fly down this alley of discussion. It is very important for you folks to know that studies have shown for years that seed junkies of all types of birds are very frequently Zn and calcium deficient, vitamin A and D deficient, and overweight. This is because an all seed diet is one that has an inappropriate amino acid balance, contains low quantities of fat-soluble vitamins, and contains many empty calories. Now, you might argue, quite correctly, that birds in the wild commonly consume a wide variety of seeds and fruits depending on the species so seeds and fruit in plentiful amounts should be o.k. Not so much! It needs to be pointed out that native birds in the wild experience a much different life-style then cage birds do. Take for example my wild relatives that feed on fruits, especially wild figs, seed, nuts, berries, buds and blossoms. These birds are very busy on a daily basis flying above forest canopies or in the crowns of tall trees foraging for fruits and seeds so it follows that their daily energy requirements are much higher. Further, their natural diet is much more varied due to seasonal changes and plant diversity in their wild environment. Also, very importantly, they are in the sun often and consequently are not prone to Vitamin D deficiency as are indoor seed-fed pet birds. In essence, fending for themselves on a daily basis actually makes them healthier as long as they don’t become a tasty meal for a hungry predator of course! But forgive me…I have veered off the flight plan. Let’s get back to the discussion of cage-bird diets. Sunflower seeds and millet sprays and fruit treats and nutriberries need to be de-emphasized big- time. Sunflower seeds are like fast food…fatty and not very nutritional leading often to fatty livers and hardened arteries. The other items mentioned above are basically terrific sources of calories and little else. Any fruit is OK - but as a treat only, not a dietary staple. On the subject of the value of adding bird vitamins to your bird’s, water bowl, all I have to say is the notion needs to be nixed that you are doing your bird any favor. In fact, water with added vitamins loses its nutrient value very quickly only to become a bacterial swimming pool within a few hours. Powdered vitamins dusted on a piece of favorite fruit or veggie is a much better alternative. For us parrot types, grit is totally unnecessary. For smaller birds like budgies, canaries and finches, especially those still persisting with an all seed diet, grit in small portions may be offered, but generally speaking is totally unnecessary. In fact, over-consumption of grit can lead to intestinal blockage problems, especially if a bird is a little “under the weather”. In fact, if you do choose to have a little grit available, and if your bird is not feeling well, it is always best to remove the grit from the cage and take him to your bird doctor as soon as possible. Of course, for all birds, as with humans, food presentation is very important so I am now going to step up to the plate regarding this topic. Let’s start with your purchase of bird food at your favorite pet or grocery store. It is best, as a general rule, to buy your seed in sealed bags since it is going to be much fresher and cleaner then if it is scooped from bulk bins. Bulk bin seed mixes in most cases are neither “shaken nor stirred!” for many days or even weeks and can become quite stale and dusty especially at the bottom of the bin. Now, on to the topic of food dishes that look full that are really just full of seed shells or nut hulls. Appearances can be deceiving! Also, disappearance of food from the food dish is not a reliable way of determining if your bird is eating properly since it may be tossing most seed out of the bowl in a dedicated search for its favorite kind. (Just like my owner’s new baby does with the food she dislikes which she tosses off her highchair down to the dog). Further on the subject of food presentation, we don’t enjoy having to perform flexibility maneuvers or assume yoga postures while we eat. What we want is a sense of body security. For example, we prefer solidly secured perches that can provide us with enough headroom as we eat our dinner without our having to guard our heads from objects above us if we need to adjust our position or look up. We also want a reasonably quiet environment to dine, relatively undisturbed by noises and other distractions. If we are decrepit we need our food close and our perches low. Finally, and very importantly, we need clean, fresh water close by but above our tail level. As a personal note, it really ties my tail feathers in a knot to think about drinking or eating from soiled bowls, when simple measures can avoid the double- dip drop occurring. Please help us to avoid the inevitable when we turn around on our perches to settle down after a good meal by securing our perches ABOVE our tail feathers! To conclude, as I have stated previously, it would be presumptuous of me to imply that the ‘one size fits all’ concept applies to the subject of optimum diets for birds. As I also pointed out earlier in this article, nutrition is a very complex subject, and a healthy diet for one bird species or individual may vary widely depending on the individual’s environment, general health, age and genetic makeup. Still, I am sure that if you follow these basic guidelines you will have a head start on ensuring that your bird friend can experience a healthy, happy and long life. 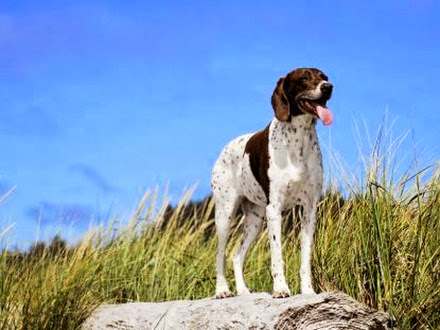 As our Case Study for this month we are very pleased to share with our Facebook friends some information about Kayla, a very energetic, obedient and intelligent German Short Haired Pointer. The focus of this study is directed not on any of her specific health concerns but on her great overall health as she approaches her 15th year of life! (Of note: the average life expectancy of this popular breed is from 12 to 15 years of age). Kayla is a hunting-type dog with the typical webbed feet and water resistant coat characteristic of her breed. When I first met her at out clinic she was 7 years old. She arrived without a leash, obediently and joyfully responding to the voice commands of her owner. This method of communication between master and dog continues to this day. Her owner’s voice is an invisible leash and is testimony to her loyalty to him and sheer joy of being in the company of her master. Kayla’s energy level has always seemed boundless to me, even to this day. I can only imagine what she must have been like when she was a much younger dog. Allow me to speculate that had I known her then my impression would have been that she moved like she had a jet pack strapped to her back and leaped at airplanes as an idle pastime! Kayla has had to overcome numerous health issues throughout her life, some quite major, including, body injuries, a chronic heart condition, hypothyroidism, chronic liver disease, and two kinds of cancer. Throughout the years numerous advanced diagnostic tests and surgeries have tested her stamina and overall resilience. She has endured all tests with flying colors! A sturdy genetic make-up along with a very observant and caring owner aware of the importance of preventive health measures have no doubt been significantly contributory to her continued good health in her sunset years. Presently, and for many years now, Kayla has been receiving a range of medications, prescription diets, and nutraceuticals addressing her changing health needs. A little more recently she has been receiving monthly cold laser sessions to help relieve her joint discomfort associated with arthritic changes. The reward of these measures is evident in what appears to be a plentiful supply of spring left in her steps as she bounds thru her autumn years! As a family tradition, Kayla’s owner has taken her to either Long Beach Washington or Cannon Beach Oregon every birthday anniversary of her life since she was a young pup. In all likelihood she will be at one of these beaches romping in the waters and on the sand in celebration of her 15 th birthday, on Sept 5. At out clinic we plan to raise our glasses to a toast that day to share our collective delight as she bounces into her future. It is with pleasure that we introduce to all readers Oreo, a beautiful spayed English Spot X bunny, as Our Case of the Month choice! She was presented to us on January 25/ 2014 because her owners had noticed that for a few days she had been experiencing some discomfort in her right eye, even to the extent of her preferring to keep it partially closed at times. To determine the status of her eye a common diagnostic procedure known as a fluorescein dye test was performed permitting a clear reason for her problem. An expansive corneal ulcer was outlined by this fluorescent-green dye test. (The cornea is the shiny, colorful outermost layer of the eye). This injury was for the most part hidden under her lower eyelid. It was likely caused by an abrasive rub of her eye by an object with a rough surface. An ophthalmic gel that contained an antibiotic combined with an eye lubricant was prescribed and a follow-up exam was scheduled for 10 days later. It was a pleasing finding on her follow-up appointment that the fluorescein dye test indicated essentially a healed cornea. The accompanying images show Oreo assuming her “Wanna come out and play with me” pose in one image and “Yum Yum Kale” pose as she is presented with one of her favorite leafy green treats. Her owners are very dedicated to attending to her nutritional needs. They even grow kale in their own garden for her (and for themselves) in the summer! They ensure that she always has access to a variety of good quality fresh hay and dried grasses as well as plenty fresh leafy greens. Additionally, of course, lots of clean, fresh water is made conveniently available to her 24/7. Her pellet rations are limited to no more than ¼ cup per day to ensure that her teeth are properly worn down and that her gastro-intestinal tract functions well. We are grateful to Tanya Tomlinson and other family members for allowing us to arrange for a photo-shoot of Oreo. She is a very photogenic bunny, with her butterfly facial markings, spots and herringbone back stripe! These features are distinctive characteristics of the ancient English Spot breed, which makes up part of her heritage.